Greetings, I was driving through bore 1 of the Fort McHenry Tunnel and noticed that towards the middle, the fluorescents were off and three different LED arrays were installed. I liked the third one the best. Check it out if you're in the area. Bore one is the northernmost tunnel, the one for Southbound traffic, closest to the right side of that road. Is there a link to that, like a newspaper article or something? Have they ever used LOW pressure sodium lamps? Not that I know of in either the Ft McHenry or Baltimore Harbor tunnels...however, the Harbor Tunnel Thruway had them for years. Remember the "banana" luminaries (I understand from another source that they were Westinghouse Whiteways) along the approaches to the BHT? Oh, absolutely! I thought it was a signature look for the thruway and hated to see it go. Me too. Never saw such luminaries on any other public highway in the U.S., though a maintenance person with MdTA told me these were difficult and expensive to maintain, which may have contributed to their demise in the early 1980's. When did they get rid of some of the safety features they built into the tunnel? I remember reading that they made the portals brighter, with lighter colored paving to prevent the black hole effect. Also, when did they ditch the VMS speed limit signs? 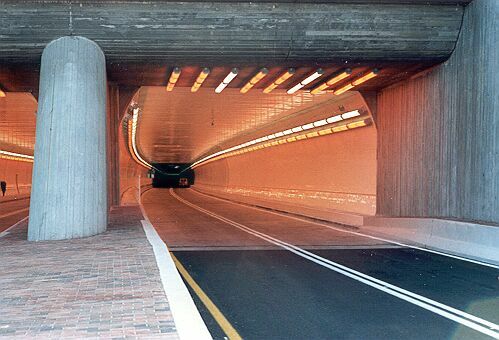 Both tubes had a reconstruction after the Fort McHenry Tunnel opened in 1985 - one tube at a time was completely shut-down for the long term project. When each tube was reopened, they looked essentially like they do today. I was talking about the 1985 Fort McHenry Tunnel. I remember that stuff in the 1990s til 2004, the last time we went down to NC prior to my grandfather dying. 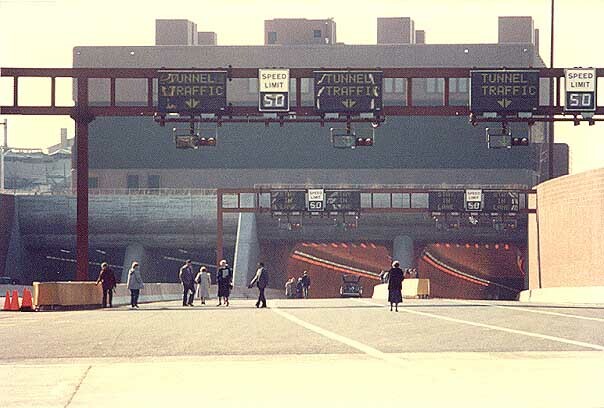 Those lighting fixtures on the Harbor Tunnel Thruway were fluorescent lamps, which were actually quite common in many cities, right down to the davit style of pole. If you look at pictures of the lighting used on the "great white ways" back in the 50s and 60s, a lot of times it was fluorescent fixtures. These lights, as noted, did have significant maintenance challenges, and so they were a technology that was not used for very long. They were indeed fluorescent lamps, and they would blink and flicker at sunset as they warmed up (it seemed to take longer for them to get going during cold weather). I never recall seeing them anywhere else in Maryland (and I have long ago been to every county in this small state), nor do I recall seeing them in the District of Columbia or Virginia. Many gas stations and other private owners of paved surfaces had them. Has MdTA ever used low pressure sodium lamp fixtures? Speaking of lights though, were the old high mast lights at exits 93 and 89 as well as between the beltways, mercury vapor or metal halide? I think they were mercury vapor, but I'm not too certain. And what year did those high mast lights go up? I do not recall ever seeing LPS luminaires on any state-maintained highway in Maryland (toll maintenance or SHA maintenance). Places where they seemed to be common include San Diego County, California (on roads maintained by Caltrans and those maintained by the county or a municipality and on private property too (the county has an ordinance that effectively mandates LPS to protect the Palomar Observatory)); and on motorways in Sweden (Sweden used to hang the luminaires from span wires high above the pavement (say 10 or 15 meters), but the ones I am familiar with have been removed). The high-masts between the Beltways were installed as part of the construction of that part of I-95. and I believe all of them were mercury. High masts on the JFK Highway part of I-95 were not original to the original 1963 toll road, and I believe they were added in the 1970's, also mercury to start with. Low Pressure Sodium lamps were used in tunnels in New York City at one time. And now, they've started replacing the old lights in the tunnel with new LED's. Has anyone noticed that? Yes. I normally drive the BHT and not the FMT (though that may change as the Canton Viaduct replacement and tunnel rehabilitation project gets going), but I was through the FMT southbound and noticed that.